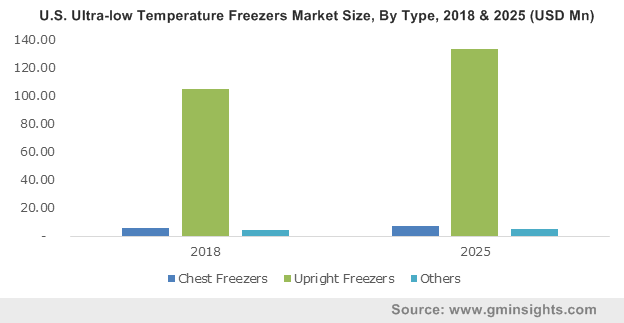 Ultra-low temperature freezers market size was valued at USD 251.4 million in 2018 and is expected to witness 3.5% CAGR from 2019 to 2025. Rising incidences of infectious diseases, cancer and other chronic diseases coupled with growing adoption of personalized medicines has accelerated new drug development procedures thereby stimulating demand for ultra-low temperature freezers (ULTF). Development of new drug and its introduction into the market is a lengthy procedure involving numerous clinical trials and studies. Ultra-low temperature freezers play a significant role in storage and protecting these drugs, and sensitive ingredients for continuity of research. Increasing adoption of such freezers in drug discovery process will positively influence ultra-low temperature freezers industry growth during the forthcoming years. 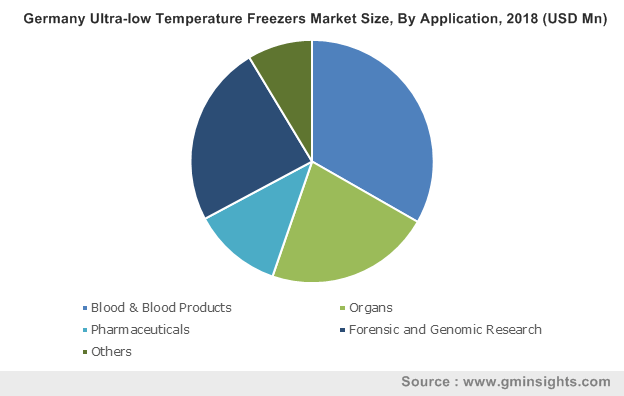 Increasing genomics research activities will further spur ultra-low temperature freezers market size. Genomic research projects such as Human Genome Project (HGP) has facilitated development of new sequencing technologies such as next generation sequencing (NGS). Growing awareness about role of genomics in human health and treatment has accelerated genomic projects growth. This will increase the demand for technologically advanced ultra-low temperature freezers thereby ensuring business growth over the forecast period. However, regulatory issues and high cost associated with ultra-low temperature freezers may restrain industry growth during the analysis period. Upright freezers dominated the industry with 90.8% revenue share in 2018 and is expected to witness similar trend over the coming years. Increasing adoption rate and technological advancements leading to operation management and enhanced accessibility will drive upright freezers business growth over the forecast period. Moreover, requirement of less floor space as well as convenience in organizing and monitoring frozen material will further favor segmental growth. Chest freezers segment is anticipated to witness 2.3% CAGR over the forecast timeframe. Chest freezers are frost free or have automatic defrost capability and are cost effective as compared to upright ultra-low temperature freezers. More storage capacity, convenience and energy efficiency offered by chest freezers will stimulate segmental growth during the coming years. Blood & blood products segment accounted for more than 33% revenue share in 2018 and is anticipated to show significant growth over the forecast period. Increasing applications of ultra-low temperature freezers for storage of red blood cells, plasma products, white blood cells and other blood components will contribute to segmental growth. Growing number of accidents and emergency cases will surge the demand for blood and blood products and thereby will aid in business growth. Organs application segment held significant revenue in 2018 and will show lucrative CAGR of 3.6% over the analysis timeframe. Demand for organ transplantation due to accidental injuries and growing number of trauma cases will boost the demand for ultra-low temperature freezers. Shortage of organ supply and increasing number of people in waiting list will foster the demand for better and advanced techniques for organ preservation. Automated freezers segment held highest revenue share of 85.2% in 2018 and will witness robust CAGR over the analysis timeframe. Increasing use of automated freezers in high throughput biobanks considerably cuts down the time required to retrieve and store samples thus propelling segmental growth. Growing adoption of automated freezers for storage of compounds and biological samples such as DNA/RNA, oligonucleotides, tissues, cells, proteins, plasma, serum and bacterial clones will drive segment growth in the foreseeable future. Semi-automated freezers segment will show 2.2% CAGR over the analysis timeframe. Segment growth is attributable to rising clinical development portfolio and application in personalized healthcare will lead to substantial growth in sample collection. Semi-automated features such as microprocessor controller, ergonomic door handle and double-door upright option allows long-term storage of samples. North America dominated the global ultra-low temperature freezers market with USD 129.2 million in 2018 and is expected to have significant growth in the foreseeable future. Rising initiatives as well as investments by public and private organizations particularly in the field of healthcare will drive industry growth in the region. Increasing focus of companies on R&D activities for development of efficient products to reduce energy consumption will increase ultra-low temperature freezers market size. 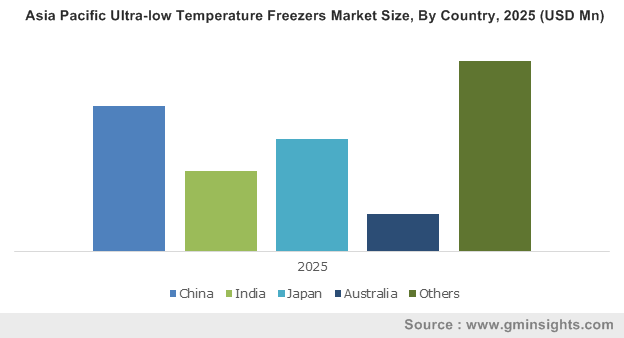 Europe ultra-low temperature freezers market held significant revenue in 2018 and is estimated to witness 3.7% CAGR during the forecast period. Increased number of blood donations and numerous initiatives such as awareness campaigns undertaken by public as well as private organizations to increase number of blood and organ donors will drive the demand for ultra-low temperature freezers. Rising adoption of ULTF for storage of red blood cells, plasma products and white blood cells will further propel regional business growth. 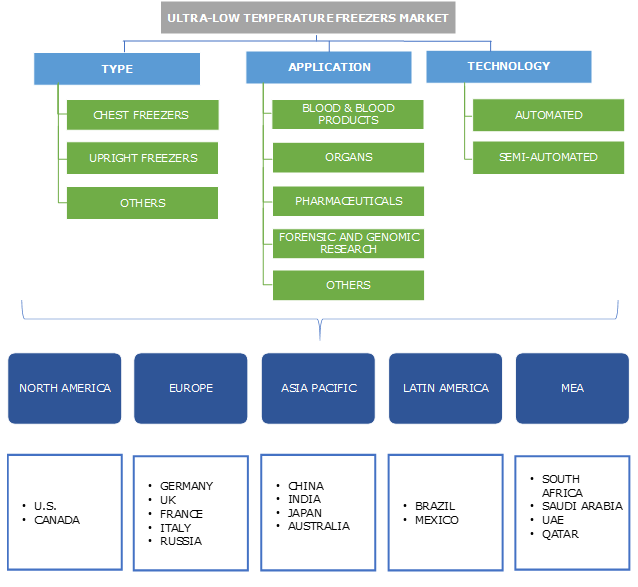 Some of the key industry players operational in the ultra-low temperature freezers market include Arctiko, Azbil, Binder, Eppendorf, ESCO MICRO PTE, EVERmed, Haier, Helmer Scientific, Panasonic Healthcare Corporation of North America, Stirling Ultracold, Thermo Fisher Scientific and VWR International. Major players implement strategies including mergers, new product launch and acquisitions that assists them in strengthening their position in the market. For instance, in May 2017, Arctiko entered a strategic partnership agreement with Koelegruppen to develop, produce and deliver low temperature storage solutions to the biotech, life science, health and pharmaceutical industry. This partnership rendered company with sustainable profits and enhanced customer base. Freezers were available as the ice-cube compartment within the refrigerator unit until the Second World War. ULTF industry can be traced back to 1940’s with the introduction of separate freezers in the market. Mass production of these freezers for domestic use began after the Second World War. In 1968, companies such as ScienTemp began manufacturing laboratory freezer. SANYO, in 1987, developed the MDF-2135, their first ultra-low temperature freezer, capable of achieving temperatures of -135°C. Further in 1997, the company introduced the ULT freezer MDFU70V, world’s first vacuum-insulated freezer, that operated at -86 °C. In 2001, New Brunswick Scientific (NBS), developed Innova Model U101, being pioneer in upright and personal-sized ULT freezer that fits under or on the bench. This model was introduced to render scientists the convenience and security of keeping samples directly in the labs. The U101 used vacuum insulation panel technology to maximize internal storage without hampering external dimensions. Later in 2010, SANYO introduced safest ULT freezer equipped with -86° Dual Cool technology that evaded conservative cascade refrigeration technology by using two completely independent auto cascade cooling systems and one-compressor, each capable of maintaining ultra-low temperatures. Growing demand for cryopreservation solutions following scientific and medical advances, such as increased use of cryopreserved stem cells in transplants and oocytes in IVF has stimulated the ultra-low temperature business growth. Increasing focus of companies on development of advanced and superior quality ultra-low temperature freezers will further escalate industry growth during the forthcoming years.